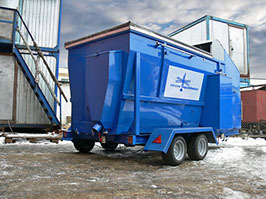 The mobile Snow Liquidator is an efficient and innovative way to simplify your snow removal process. It is designed for both reprocessing and forced snow-melting as well as separates litter and debris from the snow. Its design is for open air operation and can be installed in specially dedicated areas to meet your removal needs. The Snow Liquidator is an economical solution to the inefficient, expensive process of physically hauling snow.